Aberdeen boxer Lee McAllister has set his sights on the Commonwealth lightweight title. McAllister - dubbed the "Aberdeen Assassin" - will fight an as yet unnamed opponent at Aberdeen Beach Ballroom on 14 March. The winner could earn the right for a bout with Amir Khan for the Commonwealth title. 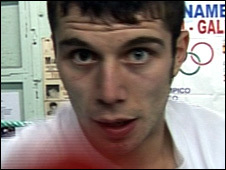 McAllister told BBC Scotland he has got over his British lightweight title defeat to John Murray last month. McAllister has previously won the WBU lightweight and WBU light-welterweight titles. He has won 27 fights and lost two.